Anguilla is the perfect choice for a quiet romantic vacation. The gorgeous sunsets, easily accessed uncrowded beaches, spectacular restaurants, and intimate Caribbean villas make this a perfect getaway for two. Families will find the pace of Anguilla charming, and the abundance of watersports will keep anyone from getting bored! Anguilla, which is located in the Eastern Caribbean, is the northernmost of the Leeward Islands. Just sixteen miles long and 3 miles across at its widest point, the island covers an approximate area of 35 square miles. Anguilla was colonised by English settlers in 1650 and is currently a British Overseas Territory. The people of the islands are friendly and gracious, and visitors will find the islands welcoming. Crime is rare, and the island is peaceful. The absence of big chain hotels and restaurants helps to preserve old-world Caribbean charm. Although shopping on Anguilla is somewhat limited, a short 20 minute ferry will put travellers on the island of St. Martin / St. Maarten. Anguilla is easily reached via air and sea. Main points of entry include Puerto Rico, just 200 miles to the east. Easily traversed by car in approximately half an hour, the island boasts over 30 stunning white sand beaches! Although the Eastern Caribbean dollar is the official currency, the US Dollar is widely accepted. Anguilla is wild about boat racing! Events are held throughout the year starting around Easter and finishing in August with the Champion of Champion Race at the end of ‘Boatrace Week’. Boatrace is celebrated with music, dancing, barbecues and, of course, boatracing! To find Anguilla villa rentals by owner, for your next holiday, simply select Anguilla as the destination in the “BROWSE BY” tool bar towards the top of the page. If you have set vacation dates use the “AVAILABILITY SEARCH” box, which blends in/out to the right of the slideshow. 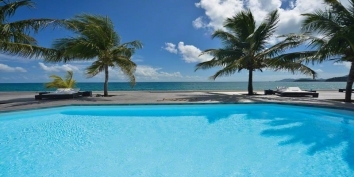 Alternatively, you can simply browse through the following list of Anguilla villa rentals by owner. Villa Mystique is reputed to be the largest villa on the exclusive island of Anguilla with a total of 21,000 square feet (almost 2,000 square meters). This Anguilla luxury villa rental showcases 5 oversized suites (4 Grand Villa master suites and the ultra-private rooftop Loft master suite) and an optional Junior Garden Suite. With a total of 8.5 bathrooms, 3 pools, and the Sheriva state-of-the-art gym housed on the ground floor, Villa Mystique positively mystifies even the most discerning traveler. Find out more about Villa Mystique, Villas at Sheriva, Cove Bay / Maundays Bay, Anguilla. 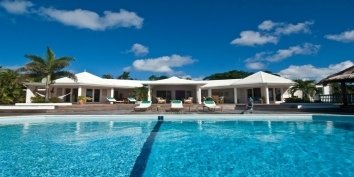 Villa Infinity is 14,000 luxurious square feet on the exclusive Caribbean island of Anguilla. The furnishings and interior design of this luxury Anguilla villa rental successfully blend distinctive Caribbean charm with contemporary sophistication. Villa Infinity offers a total of 8 bedrooms (5 exquisite suites, 1 rooftop loft suite, 2 guest rooms with two twin beds), a total of 8.5 baths, and 2 pools with hot tubs. Find out more about Villa Infinity, Villas at Sheriva, Cove Bay / Maundays Bay, Anguilla. Influenced in design by centuries old Tuscan architecture, but with modern amenities, this charming villa offers effortless beach access with breathtaking views of the island of St. Martin. “Lifting a finger” is optional as Villa Alegria is professionally managed. Let Alegria’s staff take care of your every need and whim during your stay. From entertainment to personal chefs, airport transfers to snorkel trips, we can organize everything so you don’t have to. 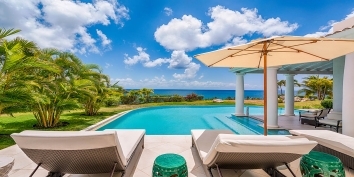 Find out more about Villa Alegria, Blowing Point, Anguilla. Villa Harmony is 14,000 luxurious square feet on the exclusive Caribbean island of Anguilla. The furnishings and interior design of this luxury Anguilla villa rental successfully blend distinctive Caribbean charm with contemporary sophistication. Villa Harmony offers a total of 8 bedrooms (5 exquisite suites, 1 rooftop loft suite, 2 guest rooms with two twin beds), a total of 8.5 baths, and 2 pools with hot tubs. Find out more about Villa Harmony, Villas at Sheriva, Cove Bay / Maundays Bay, Anguilla. Three Dolphins, an elegantly furnished estate on the British West Indies isle of Anguilla, provides a most private escape for the discriminating traveler. Overlooking its own secluded strand of white sand beach, with breathtaking views of the neighboring islands of St. Martin, St. Bart’s and Saba, the villa offers a totally equipped enclave for a family or small group holiday. Find out more about Three Dolphins, Lockrum, Anguilla. The Caribbean island of Anguilla — the preferred vacation destination — requires the ultimate entertainment Mecca Villa “B On The Sea” to complete an exceptional vacation experience. This exclusive villa features simple luxury, breathtaking views and multiple relaxation and entertainment areas. Join family or friends for a holiday, reunion or celebration. Perfect for a romantic get-away! Find out more about B on the Sea, Seafeathers, Anguilla. Is your Anguilla villa already unique on CARIBIQUE? If not, find out how to list your Caribbean villa now!